Communities have a right to know about the pollution, toxics and other environmental risks where we live, work and play. 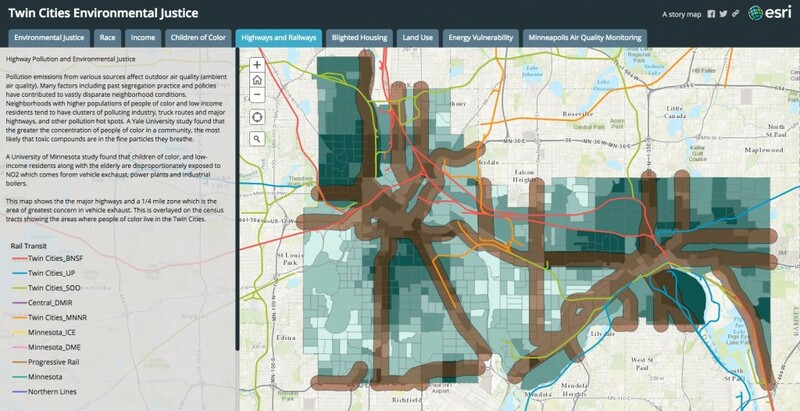 The EJ Mapping Tool provides information about pollution and toxic risks in the Twin Cities. It provides you with information about what pollution exists in your neighborhood and where they are located. The EJ Mapping Tool lets you compare environmental risks across communities based on race and income. This allows you to identify environmental and health risks you may face, and advocate for yourself, your family, and your community. Read the EJ Mapping Tool Factsheet for background information on how this tool was developed. In partnership with the Little Village Environmental Justice Organization, CEED is currently working to develop a Chicago-based EJ Mapping Tool for community organizing efforts. A Tale of Two Neighborhoods: Read our infograph that shows what the EJ Map can tell us about disparities in environmental conditions in two Minneapolis neighborhoods.